When I have leftover rice, I usually end up making some fried rice, a cold rice salad or fried rice patties. This time, I decided to experiment with making something sweet. I was all set to make some totally faux-horchata but at the last minute decided on rice pudding instead. I’ve made rice pudding before with arborio rice using a custard base, but this recipe is a bit different as no eggs are necessary, so it would be really easy to make this dessert vegan by using rice or soy milk instead of dairy. For me, this dessert manages to kill two birds with one stone: not only do I get to use up leftover rice, but I also can finish up my open can of coconut milk leftover from last night’s peanut sauce. This pudding thickens up quite nicely and resembles the kind of coconut rice pudding dessert found at Indian restaurants. I love the taste of cardamom here and the crunch of the almonds adds a nice twist to this creamy, coconutty dessert. 1. In a medium saucepan, heat 2 cups of skim milk with the rice over medium-high heat. When the mixture starts to boil, lower heat and stir until thickened, about 5 minutes. 2. Add in the cream, coconut milk, sugar, cinnamon and cardamom and return heat to medium-high. When mixture boils, stir for a few minutes and then lower heat to a simmer. The milk will start to evaporate and the mixture will thicken. Stir occassionally, making sure the mixture isn’t getting too hot (ie. sticking to the bottom of the pan!). Stir in raisins and almonds, shortly before removing from heat. Remove pudding from heat when mixture is just shy of rice pudding consistency. The mixture will thicken up when cool. Place pudding into a large bowl and cover with cling film touching the surface to prevent skin. Serve at room temperature or cool. lovely. I’ve tried making the same thing with left over basmati and it’s worked, with the exception of almonds and coconut milk. Adding coconut milk to this probably adds a depth to the dish that wouldn’t be there with plain milk. Thanks for the idea. I have always loved rice pudding. Why I can’t seem to make it turn out right defies all logic. I tried making it with brown basmati rice once and it was horrible. I’ve also tried making it with rice milk, and even with soy milk but the recipe just doesn’t want to co-operate. I have never tried rice pudding with coconut milk (YUM!!) so I’m feeling inspired again. The weather forcast calls for a big wet, winter storm for tomorrow so comforting rice pudding seems appropriate. This sounds delicious. One silly question–when do the raisins and almonds make an appearance? Stirred in when serving? liberalfoodie, basmati would probably be more authentic but regular long grain is what i had. but the addition of the coconut milk was awesome! joanne, give rice pudding another chance. the coconut milk makes it awesome! doh, terry b, thanks for spotting my mistake. i’ve changed the recipe…you add in the raisins and almonds just before it comes off the heat. I often have leftover rice – usually I make my husband eat it with leftover meats. Now you’ve given me a better use! I’ve never had rice pudding – this will be something new! Thank you for that recipe, I can’t wait to try it! 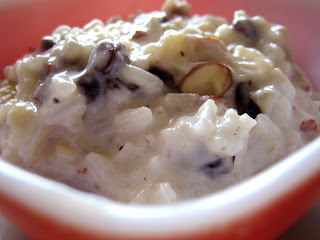 I love any kind of rice pudding and the combination with the coconut milk sound divine! cyndi, you should definitely give this a try! it’s amazingly simple and so delicious which makes it the best way to get rid of leftover rice. honeybee, give it a try! the coconut milk works wonderfully well and it’s a pretty simple recipe to boot. I just love your blog..even if I don’t comment like the other regulars..I check you all the time and have you on my blog as a link!!! love ya!!! you are fab!!! that rice pud looks delicious. awww, thanks caroline! i love hearing from readers. thank you! I made that yesturday after seeing it here and it was DELISH. YuMMM i should have made more. Viva La Rice Pudding. glad you loved it susie! my husband who claims to hate rice pudding also couldn’t get over how delicious this pudding was.